(San Diego, CA) – Late last year, we broke the news that Green Flash Brewing would be rebranding themselves, including new logo and packaging. The vibe Green Flash is giving off is that they are returning to their San Diego roots, which includes bringing back the original recipe of West Coast IPA. They have just sent a press release outlining their brand overhaul with their 2019 strategy. SAN DIEGO, CA, January 31, 2019 – After a comprehensive search for a branding and design partner, Green Flash Brewing Company tapped the combined forces of Ebbing Branding + Design of Wilmington, NC, and Mighty Few of Chicago, IL, to dramatically reshape the storied brand. With the two boutique agencies combining forces, Green Flash had access to a remarkable set of combined experiences, including a history of working with 50+ craft breweries, with notable landmark package design efforts for Goose Island Beer Co., Cigar City Brewing, Revolution Brewing, 21st Amendment Brewery, Odell Brewing Co. and Sierra Nevada. The unusual agency partnership was not happenstance. The founders of both agencies, Ian Law and Adam Muran of Mighty Few, and Matt Ebbing of Ebbing Branding + Design, attended design school at the University of Illinois in the early 2000’s—and subsequently went on to found creative agencies specializing in craft beer, wine and spirits branding and design. Upon learning that the two agencies were among the finalists being considered by Green Flash, Law, Muran and Ebbing chose to unite rather than compete—forming a bond that would both secure the project for their respective agencies, and yield provocative creative work for the Green Flash brand. “The risk of trying to work lockstep with another agency 1000 miles away was very real,” states Matt Ebbing, Creative Director of Ebbing Branding + Design. “But, the possible reward of having such a remarkable team compiled for reshaping Green Flash wasn’t something any of us could pass up—Green Flash included.”. The new logo and packaging design system for Green Flash is a cap stone on the process of resurrecting the legendary west coast brewery. “From a strategic base, we set out to evolve the logo and completely rethink the packaging to both better communicate the brand ethos, and connect in a more meaningful way with consumers,” states Ian Law, Creative Director of Mighty Few. To ensure the creative work would be strategic and focused, an objective was established to bring the brewery’s San Diego West Coast spirit to the surface. “Our new visual identity represents a dramatic shift for the Green Flash brand and reinforces its origin as one of the original San Diego craft beers,” states Green Flash Brewing Co. VP of Marketing Ben Widseth. The creative teams at Mighty Few and Ebbing Branding worked with the Green Flash team to develop the story for each product. Numerous rounds of conceptual sketching ultimately led to artwork that is illustrated in a uniquely Green Flash surf adventure style. “The challenge in rebranding Green Flash wasn’t about figuring out what’s so special, the brewery has a storied past and world-class beers, but rather how to manifest the most compelling aspects of their story and products in a way that will truly connect with consumers,” states Ebbing. 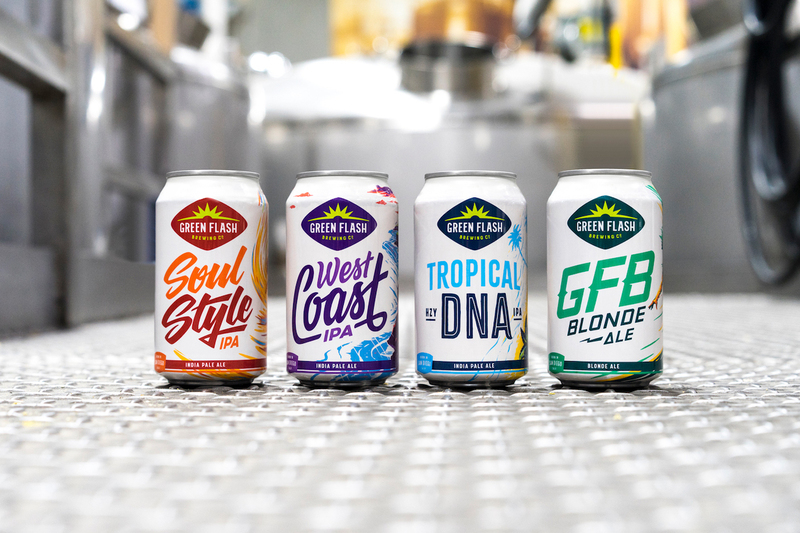 The innovative lineup of core beers, each with its own story – West Coast IPA, Tropical DNA Hazy IPA, Soul Style IPA, GFB Blonde Ale – will be the focus for Green Flash in 2019. Additionally, all core beers will now be offered in 12-ounce cans to meet the growing demand for cans by consumers. 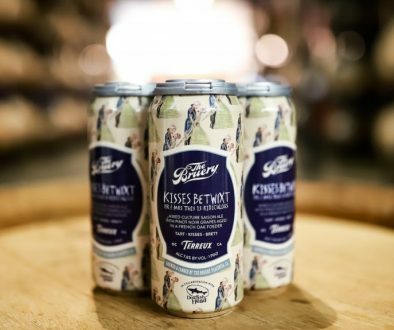 “Not only does the new package design bring these inspiring, San Diego-centric stories to life, but there is also a level of design detail rarely seen in craft beer packaging—it’s these details, that you find on every 6-pack, bottle and can, that the craft beer consumer recognize as a sign of impeccable quality,” states Law. Ebbing Branding + Design is a boutique creative agency that helps its partners develop, evolve and grow their brands. 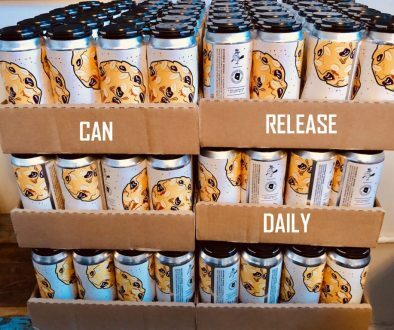 Their client list includes some of the United States’ best-known and fastest-growing craft beer brands, as well as clients in the wine, spirits, kombucha and packaged food industries. The agency provides diverse design, content, strategy and advertising services so that your brand will speak clearly and consistently across all of your needs. Please visit ebbingbranding.com for more information. Mighty Few is a design agency in Chicago focused on brand creation and development. Over the past decade, they have played an integral role in shaping the identity and voice of many well-known breweries in Chicago and across the country. Founded by designers Ian Law and Adam Muran, Mighty Few is a partnership driven by a passion for real, hard-fought solutions and collaborating with like-minded brands – those obsessive about what they do and getting where they want to go. Please visit mightyfew.com for more info. 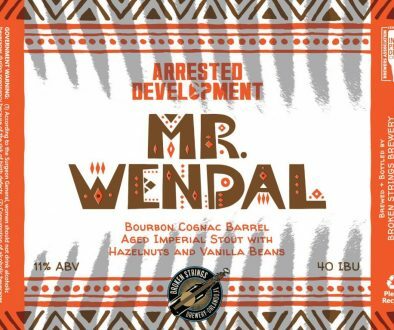 Dogfish Head & Brouwerij Rodenbach SeaQuench Sour Collab Can Release Daily 1/31/19 – Alvarado St., Fieldwork, Noon Whistle & More!